1To start using Webcast Slides for your on demand videos simply Log in to your account, Located the video you wish to add slides to and click on the "Settings" button located next to the video or live event player name. Then click on the “Webcast Slides” tab. 2Now in the Webcast Slides sectio simply upload your slides by clicking on the "Choose File” button. then enter the name you wish to give to your slide and click the “Upload Slide” button to complete. Once uploaded it will show in the available section below. 3Repeat steps 1 and 2 for all the slides you wish to add. 4To use a slide simply drag it from the “Available section (Orange)” to the “Active section (Blue)”. 5Now simply set the time you wish your slide to start by entering the hour (HH), minutes (MM), and seconds (SS) at which the slide should appear in your webcast. then click “Update” to save the time settings. 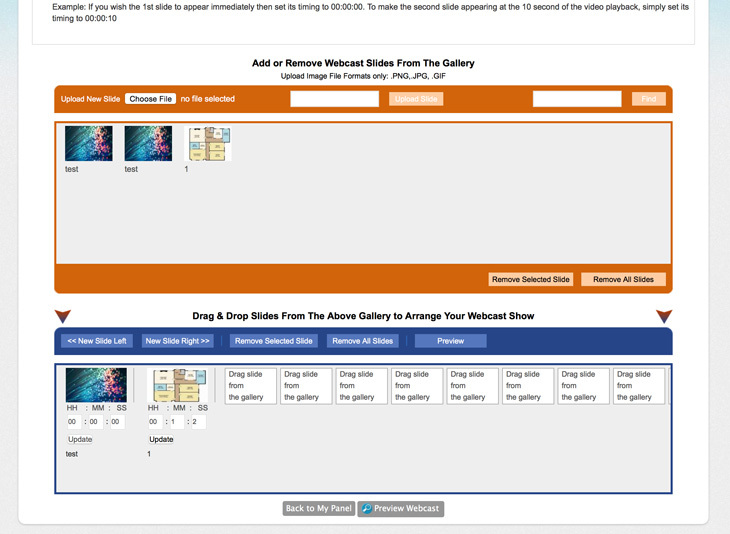 6Once ready simply click on the “Preview Webcast” button to preview your webcast slides. 7If you are happy with them click on “Get Slide Embed Code” which takes you to the publishing section. Here enter your desired size for the Webcast Slide Viewer and click the large “Preview” button to generate the embed code. Access to all features. No obligation or credit card required.